"Youth Week Festival" is organized by Paavai Institutions from 20th to 24th December 2010. On the second day of the festival Shri.V.Velan, Deputy Superintendent of Police, Namakkal, was the chief guest. The function begins with the prayer song. 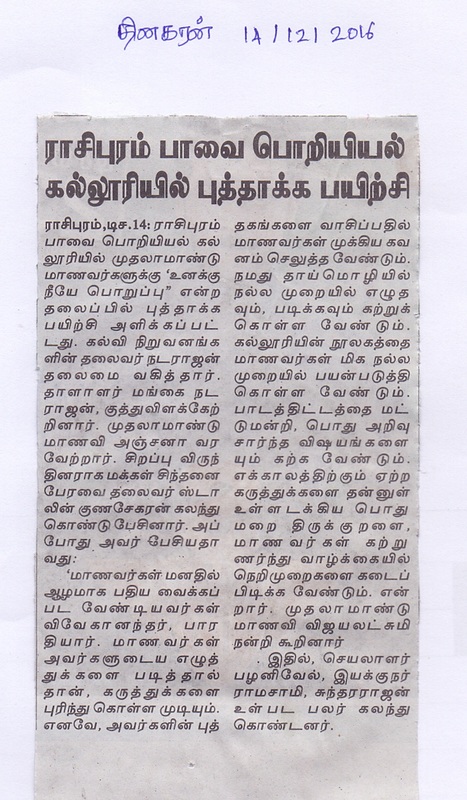 Shri CA.N.V.Natarajan, Chairman of Paavai Institutions along with the Chief Guest, lighted the Kuthuvilaku. Shri. CA.N.V.Natarajan, Chairman of Paavai Institutions presided over the function. In his presidential address he stressed that police are our friends. We must come forward to help them and not to violate the rules and regulation. The chief guest addressed the students, and he requested all the students to follow the rules and regulations promptly. To lead a harmonious life changes are must and at the initial stage it should come from student side. There are lots of changes found among the behavior of the police, and that changes are due to the benefits of public. Only students like you can bring tremendous changes and uplift the society. He appreciated the discipline found among the students and he again requested to follow the same discipline not only in the college but also everywhere. Helping tendencies should arise from all, during accident help the injured persons as soon as possible. There will be no unnecessary inquires for helping them from police side. In his key note he stated that changes are very much necessary for the uplift of the society. An interaction session was held at the end of the session, he readily and convincingly answered all the queries raised by the students. A memento was presented to the chief guest Shri.V.Velan, Deputy Superintendent of Police, Namakkal by Shri. CA.N.V.Natarajan, Chairman of Paavai Institutions. Prof.P.S.Subramanian, Dean-Polytechnics, Prof.K.K.Ramaswamy, Director- Administration, Shri.K.Senthil, Director- Admission, and Principals, Head of Departments, Faculty members and Students were present.